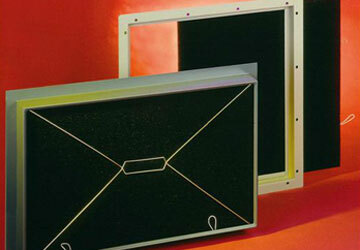 Re-usable Dust Filters provided in panel format suitable for HVAC applications offering very high dust loading capacity. Laminated polyurethane foams of differing porosity bonded to an internal mesh to provide a semi-rigid filter. These cleanable filters can be supplied with front or side withdrawal frames if required. A cleanable filter identical in construction to the Emflex but without the internal metal mesh, resulting in a filter that is fully flexible and collapsible. Filter frames are available with supporting grilles and retaining clips. Both filter types are particularly suited to high humidity applications and will not distort due to moisture adsorption. Typical efficiency of the Emflex and Plipad filters: G2/G3, other versions available on request.